It was Friday, a holiday as August 14 is the Independence Day of Pakistan. I was dragged by Engr. Ghulam Abbas Cyclewala to attend a flag hoisting ceremony at Al-Nadil Burhani a beautiful Sports Complex near Railway Station owned by Dawoodi Bohra Community. The ceremony was performed by the Chief of Rangers Col. Shahid and was followed by bands and the Guards March Pass. Engr. Cyclewala insisted on visiting his friend Engr. Samiuddin as his wife makes good Samosas and we could have a nice cup of tea with him. I thought it was a good idea, as I always wanted to write a brief on Engr. Mohammad Samiuddin Mirza being one of the Senior Mechanical Engineer of NED, who has lived for over 30 years in Abu Dhabi. At last I got the opportunity. We were given a warm welcome by him and his wife Humera Muntaz in their house near Delhi Naval Housing Society. It was a well decorated and well-furnished house. His daughter Hina Sami served steaming hot Shahmi Kababs, followed by Sweet Basin Halwa prepared by none other than Samiuddin himself, disclosed by his wife. Cyvlewala remarked to Sami Bhai, you are good cook. Samiuddin with a smile on his face said, I can make sweet dishes and Humera is a Saltish Specialist. While taking tea, I started my work as I knew very little about him. I asked Engr. Samiuddin Mirza to tell us about his background. His wife came closer...to hear all about him. Samiuddin while scratching his head, cleaned his spectacle, started by saying... I was born in Karolli State, Rajputana India, in 1946. I belong to a very religious family. We were very well settled and affluent in India with large ancestral estates and properties. My Grandfather was Member Parliament in the Assembly of Rajputana India. My father Mohammad Alimuddin was a Dental Surgeon and Specialist Doctor of Maharaja Court. He was awarded the Honor of Khan Bahadur for his Services. I was the youngest child of ten children born to my parents. I had four elder brothers and five elder sisters keeping me under their watchful eyes while I was growing up. It was tough at times to please everyone and the different demands and expectations of my older siblings. My brothers focused on disciplining me and ensuring that I received a proper education. My sisters focused on developing my manners and teaching about my responsibilities to my family and my parents. My sisters were the ones who also pampered me and gave me unconditional love and support throughout my youth. And even today I share a special bond with my sisters. Where did you get your primary education? This time his younger daughter Hina Sami came closer to hear his father’s story. Father disclosed, by saying...I was one and half-year-old when we came to Pakistan in 1947. We stayed in Nawabshah as my uncle lived there before the partition later shifted to Karachi. My early schooling was from Government Boys School, Lalkothi, Shahrah-e-Faisal, as it was not far of our home. I was transferred to the Government Boys Secondary School at Jail Road. I sat for my matriculation examination at the age of 14 tears and passed with distinction in four subjects. What about your Secondary and Higher Secondary Education? I completed my Intermediate and Bachelor’s Degree in Science from Government College for Men in Nazimabad. I secured First Division and assured my place in the prestigious NED Government Engineering College now NED University of Engineering & Technology. I passed the BE (Mechanical) Examination from the batch of 1968. How did you start your career? Samiuddin was quite for a moment, and then he looked on the roof for a while and taking a long breath. Started by saying it is a long journey... I was Assistant Manager, Pakistan Machine Tools, Karachi, 1968 thru 1970. Executive Engineer, Karachi Electric Supply Corporation, Karachi, 1070 thru 1974, Maintenance Superintendent, Water and Electricity Department, Abu Dhabi, United Arab Emirates, 1974 thru 1980, General Superintendent Power and Sea Water Desalination Plants, 1980 thru 1982, Manager Projects-Power and Desalination Plants 1982 thru 1987, Chief Engineer Projects, 1987 thru 1999, Abu Dhabi Water and Electricity Authority, 1999 thru 2004, Senior Manager Projects, DHA Cogen Ltd, Karachi, Pakistan 2004 thru 2011. Tell me Sami Bhai which was your big achievement from all said? He thought for a while and revealed... 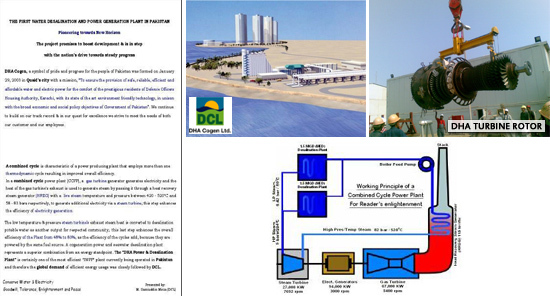 Achievements: Project Manager Large Corporation, Projects in Field, working as Senior Manager Projects at DHA Cogen Ltd., the first seawater desalination plant in Pakistan. Yes I forgot, when did you get married to this beautiful looking Lady Humera Mumtaz? And what is your family size? Samiuddin, started laughing in a style, and this time the lady vanished in another room. He said was married to Humera Muntaz on March 13, 1975 and blessed with children: Nigar Sami-1976, Nida Sami-1979 and Hina Sami-1982. He further added that two girls are happily married and now he prayed for the third daughter. Sami Bhai what are your spare time interest? Frankly I am looking busy doing nothing…Ha! Ha!! Interests: Management Shareholding in Providence Modaraba Ltd., Karachi, 1988. Contributed articles to Encyclopedia of Life Support Systems. Served as President Overseas Pakistani Investors Forum, Abu Dhabi UAE. 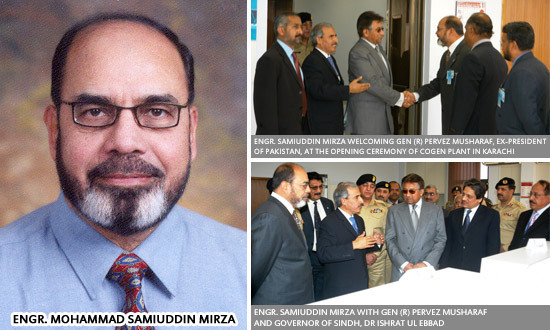 Member of Thinkers Forum Abu Dhabi-UAE 1991 thru 2004; Served as President Maths Society Government College Karachi 1953 thru 1964; Life Time Member of Institution of Engineers Pakistan (IEP); Life Time Member of Pakistan Engineering Council (PEC); Member of Overseas Pakistani Foundation (OPF); Member of International Desalination Association (IDA) USA; Member of American Society of Mechanical Engineers (ASME). Engr. Mohammad Samiuddin Thank You very much for giving us a lot of your important information and sparing the time which will always treasure and this Independence Day will be long remembered. Will you like to give any message to young generation? I am grateful to Engr. GA Cyclewala, as I had invited him by saying that my wife makes good Samosas. And that has attracted him as he is fond of Samosas and unfortunately we served you Shahmi Kababs, come again for Samosas. My message for young generations; Our beloved Prophet SAWS had said that women, land and wealth (Zer, Zamin, Zin) are troublesome (Fitmas) and he didn’t want to disrupt the harmony and love in his family. I was.